What is the Significance of Diamond Depth and Table Percentages? 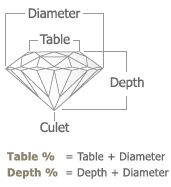 Understanding diamond depth and table percentages brings you one step closer to finding the ideal proportions for your diamonds. These factors can have a huge impact on the appearance of a diamond and once you have got to grips with the facts and figures you can apply them to your search. Depth and table are both related to the more technical aspect of cut and as the cut is the most significant of the Four C’s, it is essential knowledge for any diamond buyer. The depth of the diamond is measured from the culet to the table and is noted in millimetres. You will notice two measurements of the depth on your diamond grading report; one will record the actual depth measurement in millimetres, the other is the depth percentage which notes how deep the diamond is in relation to its width. A depth percentage can be treated as an indicator of a diamonds value and brilliance. The depth of a diamond can also help to make a modest diamond appear larger. 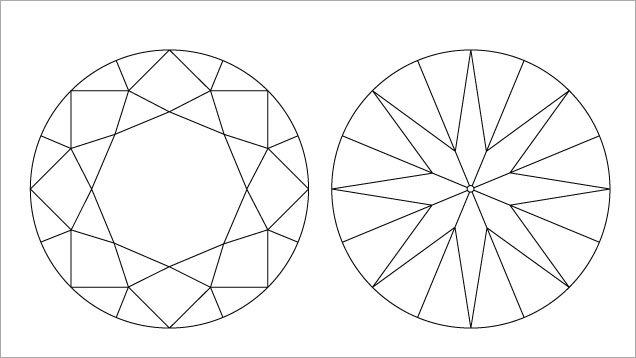 This illustration shows some of the key proportion parameters that impact a round brilliant-cut diamond’s appearance, including the depth. Extreme depth proportions can dramatically affect the sparkle of a diamond. Generally, depth percentages of over 66% and under 57% are considered poor for a round brilliant diamond. These percentages will vary depending on the cut of the diamond. For example, a princess cut diamond with a 77% or 75% depth percentage can yield an attractive diamond, however the same measurements would have a hugely detrimental effect on the beauty of a round brilliant. There is no industry-wide agreement on the absolute ideal depth percentages for a round brilliant diamond. Some believe it is within the 58%-60% range while others suggest that diamonds with a percentage of 62.9% – 59.5% are most desired. Some vendors will give a misleading outline of depth percentage, casting a wider bracket. Be cautious of these. Whiteflash specify a depth percentage of 59.5% – 62.0% for their signature A CUT ABOVE® round diamonds, which are widely considered some of the best performing diamonds available. One thing that is agreed, is that the place where the depth lies is significant. The pavilion must be cut at the correct proportions to ensure the light can be bounced from facet to facet within the diamond and reflected out at the proper angle to meet the eye. A lower depth will create a diamond that looks larger when viewed from above, as more of the weight is located in the crown of the stone. There is a limit however, and a diamond with a depth that is too low will not make a diamond appear larger, rather it will be dull and lacklustre, making it appear smaller. When it comes to depth, it really is about balance and finding the sweet spot. The table is the largest facet of a diamond; located at the top of the diamond (when the stone is face up), it plays a vital role in light performance and thus has a huge impact on a diamonds brilliance. 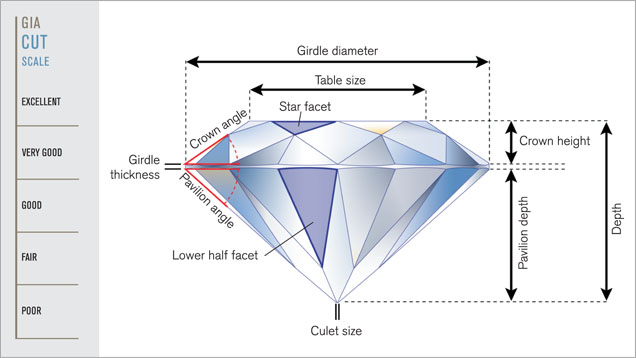 In a well-cut diamond, the table facet will refract light rays entering the diamond and allow reflected light rays from the pavilion facets and back into the eye. A larger table percentage does not necessarily equal a more brilliant diamond as there are multiple factors which dictate the final fire and brilliance of a diamond. The bezel facets of a diamond are where we observe the most fire; an overly large table limits space at the crown area meaning the upper girdle and bezel facets have less surface area. This lack of surface area decreases dispersion and will diminish fire. A smaller table will allow the girdle facets to disperse light, however it will be detrimental to the brilliance of the diamond. It is important to find a balance between light entering through the table (to create brilliance) and color dispersion through the upper girdle facets and crown (to give fire). A table percentage is calculated by dividing the size of the table by the average girdle diameter of the diamond. For a round diamond, you can easily calculate this based on the average measurements found on your diamond grading report. For fancy shapes, table percentage is calculated by dividing the table width (measured at the widest point of the facet), by the width of the widest part of the stone measured in millimetres. This can be found on your grading report under ‘Measurements’. An important aspect to remember when assessing depth and table percentages, is that this technical data is all related to the appearance of the diamond. It is, therefore, just as important that the diamond is visually pleasing to you and your tastes. They should be used as an indicator of brilliance and fire in conjunction with the other aspects of diamond buying. For the best proportioned diamonds, take a look at Whiteflash and their impressive A CUT ABOVE® diamonds. Their collection represents the pinnacle of diamond cut quality and light performance. If you’re looking for fancy shaped diamonds consider Blue Nile and James Allen who have fantastic collections.